"Don't you ever miss the days when you were nostalgic" from Dzur by Steven Brust. While sick have been re-reading from the beginning Steven Brust's Vlad Taltos series of novels. One of my favourite fantasy series. I'll go off on a tangent for a while on the subject of old arcade games and the arcades and places in town that used to have them. One game I was pretty good at was called Lady Bug - what springs to mind with this one is the old Pizza Delight on Arthur St. (later a Robin's Donuts, much later Wasabi) near my house at the time had a cocktail version of the game that I would play quite a bit. There was also a pizza place called Shakey's (not sure but might be the building that was later a Fish and Chips restaurant and now is a Mike's Mart near the LCBO) on Arthur street that had a game called Cheeky Mouse. The Airways arcade was nearby but I didn't go there much. My brother is very good at a game called Ghosts 'n Goblins which he played at his high school and later hang out - Galaxy Lanes. When I think of games at Galaxy Lanes I also think of some racing game that I found out you could tilt - the name escapes me. I associate the game Qix with the roller rink that used to exist where Smith's RV is now - Wheelies it was know by in it's later years; it changed it name from Saints, I think, because of having the same name as a rink in Duluth or Minneapolis. Centipede I think I first played in Thunder Bay Mall - either there was a small arcade there or it was in one of the main stores - Kmart (later Zellers, most recently a new Walmart). 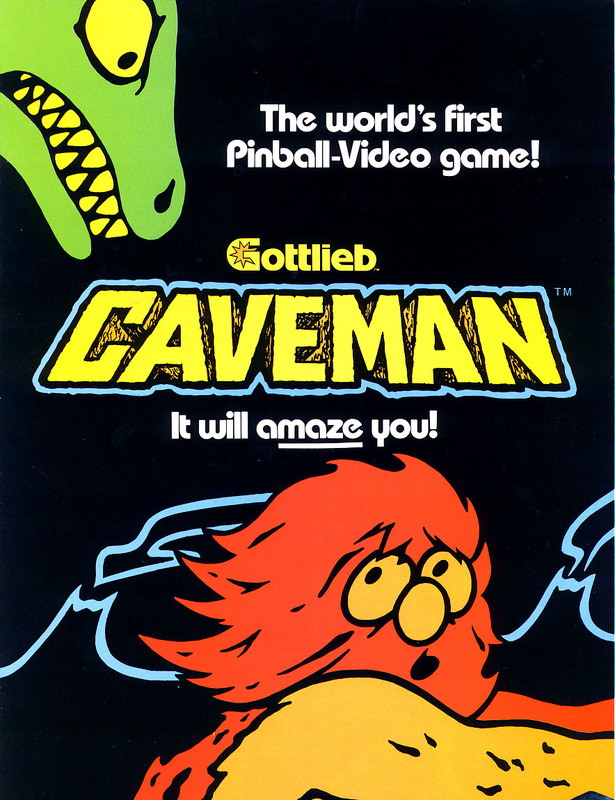 Caveman, a combination pinball machine/video game, I associate with the old 'Study' during my first attempt at a post secondary education at Lakehead University in 1987. The revolutionary for it's time Dragon's Lair brings to mind Golden Castle on May Street - think a tattoo parlor is there now. I think the other Golden Castle in the north end of town was up on N. Cumberland Street near the old now shut down Cumberland 5 cinema - Bubble Bobble is what I think of for that one. I remember Chippewa Park at one time, somewhat after the 'golden days' of arcades, had a whole bunch of pinball machines and arcade games in a large building. Pengo I played at the Mount McKay ski hill (may be a paint ball range there now) back when my parents had a ski membership there for the whole family. 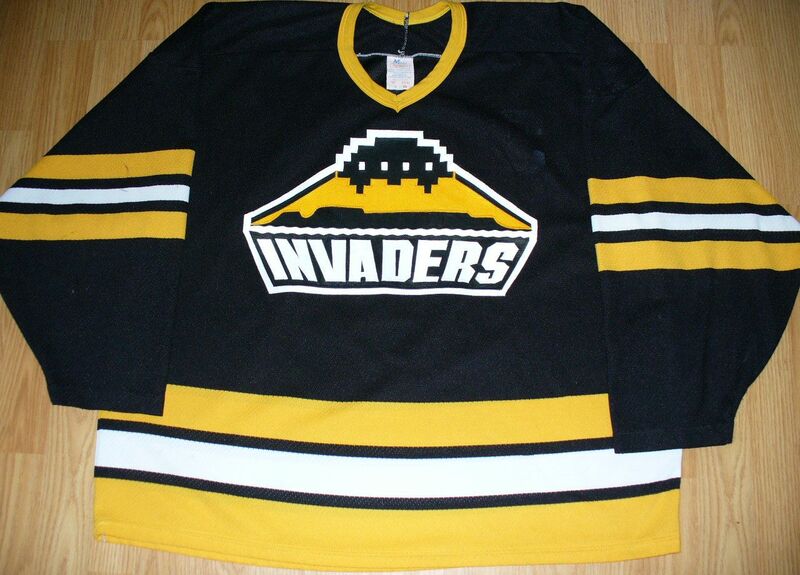 To bring things back to hockey jerseys we'll have to start with Ryan Connelly's (Space) Invaders jerseys. I think I first saw them on the Uniwatch site in an article called DIY disasters: http://www.uni-watch.com/2009/11/03/diyd-do-it-yourself-disaster/ . 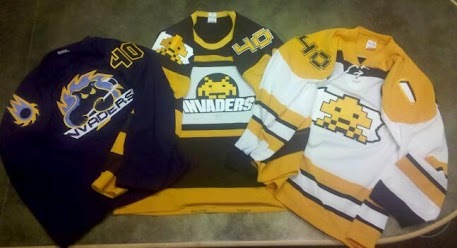 Some pics may be on the Facebook group Hockey Sweater/ Jersey Army, but I know you will find them on his blog Project 840. 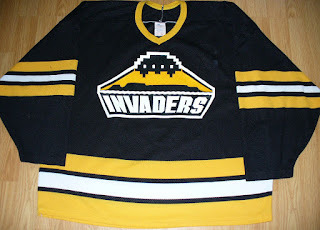 Ryan Connelly creations inspired me to make a fake minor league version of his Pittsburgh Invaders team. 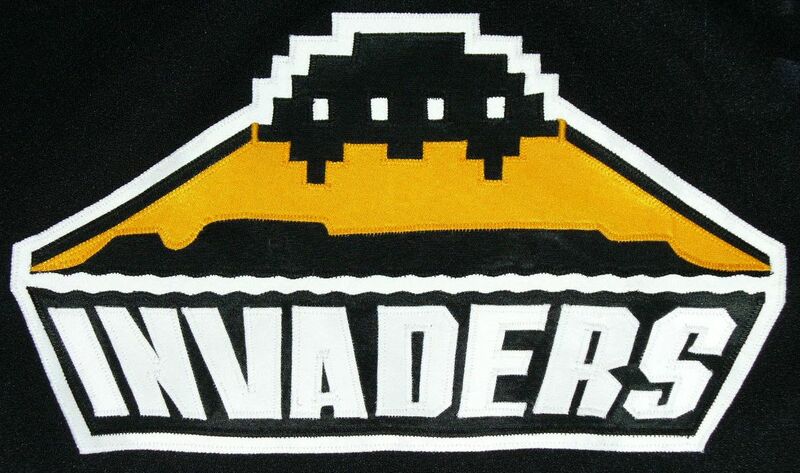 For the Thunder Bay version I went with the team name Lakehead Invaders and used the major landmark of the area 'The Sleeping Giant' in my creations. 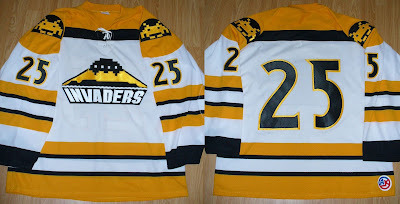 So far I have made a black and a white jersey, but will likely eventually make a 3rd jersey with a yellow with black and white jersey I got off Ebay. 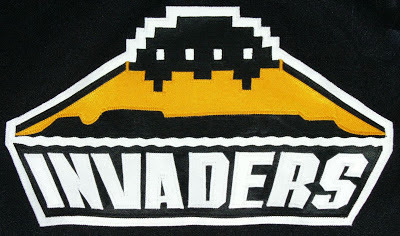 For the black jersey I used a jersey I already had that had some screen printing on the front that I covered up with my Invaders crest. I got the white jersey off Ebay and replaced the front crest and cut off parts (parts that weren't embroidered on) of the shoulder patches and covered them over with my own patches. Here's a close up of the front crest. For those of your interested in old arcade games and want to play them on your home computer - check out M.A.M.E. Most of the Roms (games) are only available at sites that the emulator (M.A.M.E.) isn't. Have any memories of vintage arcade games that you used to like? Feel free to add them (or anything else) in the comments. 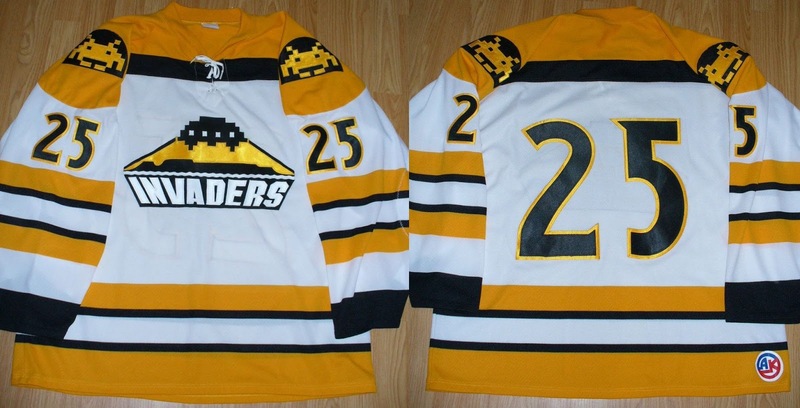 For my yellow jersey, I tried playing with a few ideas and likely have it narrowed down to two. Either a crest similar to the one I sent you a while back for an idea for my leather/melton jacket (not sure on the colour arrangements), or a simplified version of the logo for my favourite small local brewery: Sleeping Giant Brewery. Always look forward to seeing any new creations from you.